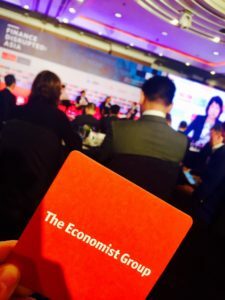 Last friday, I attended the Economist Finance Disrupted Asia Conference. As a former JP Morgan equity derivatives trader, founder of the Hong Kong startup community WHub.io and board member of the Hong Kong FinTech Association, I was eager to join listen, discover and ask questions. 1. FinTech – WT# is it ? Financial Service providers with technology as a driver to scale. The DNA should be Technology. But are we actually talking about FinTech or TechFin ? 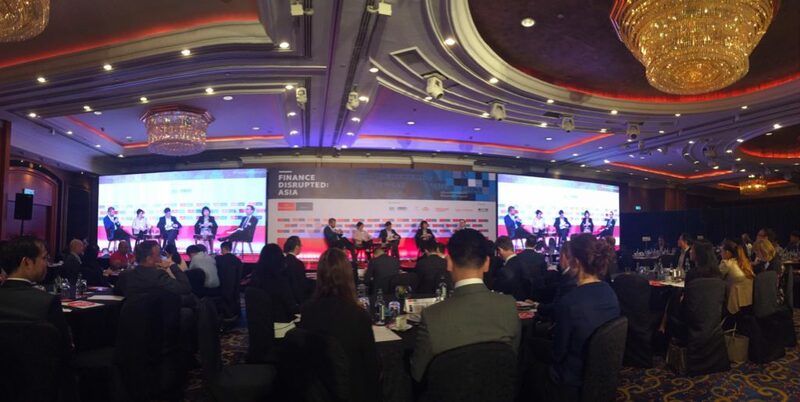 Both startups and traditional finance companies are active in FinTech and this conference gathered speakers from startups, incumbents, VCs and regulators. The FinTech startups often don’t look like a traditional bank or insurance company: they typically offer targeted solutions, as opposed to being one-stop-shops for customer financial service needs. On the other side, traditional banks, insurers and other large financial institutions have increasingly invested in FinTech as well and therefore it was not a surprised to see an Investors Panel including Arbor Ventures (Asia biggest FinTech Fund) and Goldman Sachs. 2. The new buzzword : Artificial Intelligence – why is it important and how is FinTech using it ? Remember how everybody talked about Block-chain, peer to peer lending and robo-advisor platforms a couple years ago, now the trend has shifted to AI / Big Data. AI is already used to enhanced costumer support and automatized repetitive tasks, but does AI have the potential to disrupt ? Also one important point is that AI and Big Data are not regulated! We had to wait more than one hour to hear the word Block-chain! Block-chain suffers serious “Branding issues” as it associated with Bit-coin. To get regulators and government onboard with block-chain implementations the industry is evolving and calling it as DLT. But is there really any big difference ? Block-chain is the big thing now and not bit-coin. But although it seems like the perfect solution for KYC, nobody could tell when it would be actually available. Traditional banks that do not take FinTech seriously will experience their own “Kodak moment.” In 2012, Kodak – the company that invented the first digital camera – went bankrupt at almost the same time Instagram was being bought for 1 billion dollars by Facebook. Banks are conscious they have no choice and DBS actually called itself a FinTech company. Regulators were present and talk on a very interesting panel. Contrary to perceptions, regulators are more progressive than many banks themselves. It is also a fact that nobody advertises on their initiative. 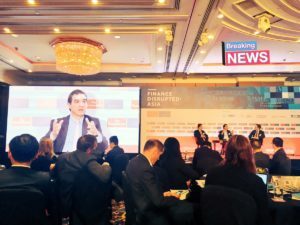 Hong Kong is famous for its regulatory stability and although it is has moved slowly (to say the least), I do believe we are entering a new era with more collaboration between FinTech and Regulators. My key take-away is that regulators and FinTech should have a positive, collaborative attitude towards each other. A main theme is that regulatory demands are only going to increase, as FinTech continues to develop and disrupt financial services. 6. China – has they already won the FinTech revolution ? China is the leader in terms of funding and influencing the market (e-commerce, internet financial model). It is already inspiring the rest of the world but although you can export an idea and inspiration how do you transport the model in other markets ? No doubt China is the leader in FinTech retail, but the interesting point was why and how it could grow more and conquer the rest of the world ? Payment is the revolution in China as you do not need to carry money anymore, but is it because the population has been underserved with almost no access to bank accounts and credit cards ? There is a real opportunity for FinTech startups to offer to people who have always been underserved (eg Vietnam). Karen Contet Farzam is passionate about Technology and Startups, co-founder of WHub.io, Hong Kong biggest startup community. 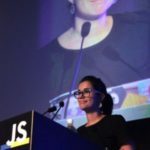 She is immersed in the Startup Scene as a Founding and Board member of the FinTech Association of Hong Kong, Community Leader for Techstars, a Front End Web Development instructor, a Mentor for several accelerator programs, speaker at International Conference like JS conference 2015 in Singapore, French Foreign Trade Advisor, FrenchTech Ambasador and Founder of WomenWhoCodeHK.Karen has been working in Asia for 13 years, starting in Tokyo as JP Morgan Exotic Equity Derivatives Trader to Software Engineer for an IoT Startup, teaching Front-End Web Development and co-founded and built WHub.io, HK biggest startup community.